Whether you need to light your driveway, walkways, plants, signs or patios, we will keep your nighttime landscapes safely and tastefully lit. Well after the sun has set, keep your business sign lit for your customers. Clearly illuminating your sign, driveway and entry helps your customers gain confidence and comfort in your business. Help nighttime visitors easily find your entrance both by illuminating your driveway and all paths leading up to your building. Especially helpful for apartment and office complexes! 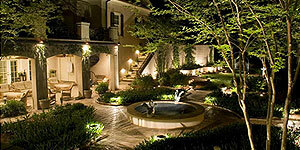 Landscaping Landscape design, installation and management. Rock walls Retaining walls, structural, non-structural, with boulders. Irrigation Sprinkler systems, waterfalls, and other water features. Lighting Illuminate features for beautfy and safety.